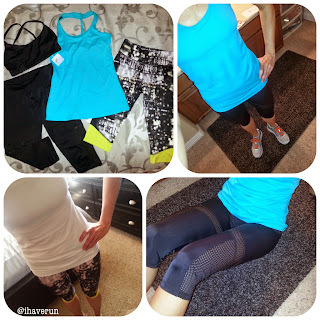 I Have Run: Onzie Activewear Giveaway!! My total running miles for May will be a big fat goose egg. However, I'm sure I'll be logging some serious cycling miles. A few weeks ago, I tried out some new clothes on some of my rides. Onzie, an athletic apparel company based in Los Angeles, sent me some items to review. I have worn all the of items several times now and am really liking them. The mesh capri is great for cycling. It keeps me cool and isn't restrictive at all. One of my favorite things is the fabric. All the items are sweat wicking, and made of what Onzie calls "Free-Flow Fabric Technology." My favorite item is the braid tank top. It has cute braided detailing in the back, and I love the way it fits. The sports bra is also great. I've worn it cycling and running, and it was supportive enough for both! Check out all the fun colors and items Onzie has to offer at www.Onzie.com. And while you're there, figure out how you would spend $75 on yourself because Onzie is giving one I Have Run reader $75 to spend on the items of his or her choice! Winner will be selected by Random.org on Friday, May 9. I want the capris in the peacock pattern, those are sweet! The Criss-Cross Bra Top and the Gypsy pants are so cute! I like the all in one tank or spinning caparisoned! I posted about giveaway on Facebook! I love the spin capris! I would love the Fitness Shorts in the black with yellow band. Thank you for the wonderful giveaway. Love the criss-cross bra top and the black gypsy pants! I would choose the sun ray bra top. soooo cute. My favorites are the cardigan and the mesh capri pants in black. I liked Onzie on Facebook. Oh my gosh, those bottoms are all amazing...but I'd just HAVE to have the Orchid Track Leggings. Seriously, those are awesome! I "liked" on Facebook & Instagram! I'd either choose the capris in black magic or the mesh capris in black. I like Onzie on Facebook! I would go chose the capri pant in meadow and elastic tank top in black an orchid. I am following @onzie on instagram. I would choose the Sunray bra top in black! I am a total hot yoga junkie always looking for cute and unique bra tops! I would love the Onzie capris in metro!! I like the tank top you got. But let's be honest...most the stuff is cute! I like the tuxedo leggings! I'd probably pick those mesh capris since it's getting so warm out already. Onzie Is one of the Best Fitwears For Womens as All Time Best Brand,As it Supports Athletics, Hot Yoga And Likely Flexible With Outdoor Yoga & Sports. For the onzie Lovers i Would like To Suggest fitnessfashions For VEry Reasonable Pricing And Quality Onzie Products As Ive Experienced It Live. I loved the workout tights. They are just awesome. Want to have some Carbon 38 workout clothes that are available on discount offers these days on an online store. Will also buy Nike air max shoes this time as they are on sale.